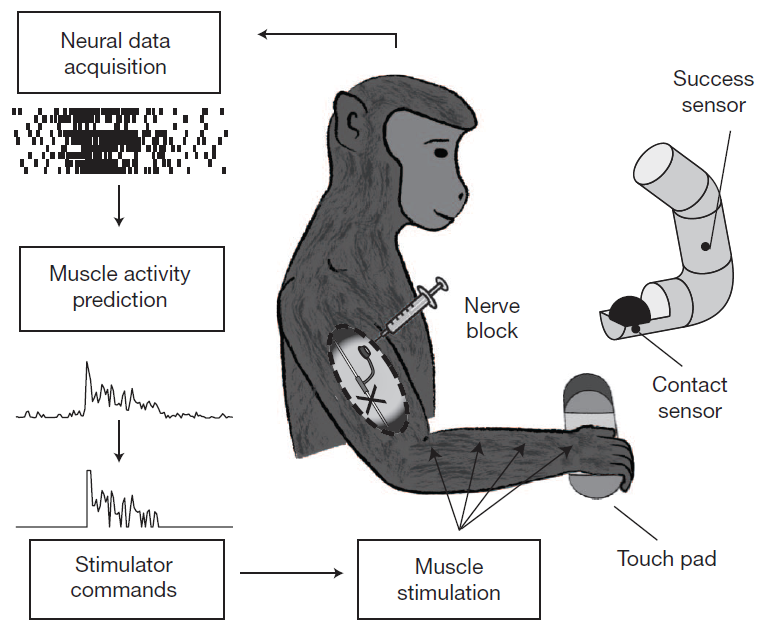 An artificial connection between the brain and muscles can restore complex hand movements in monkeys following paralysis, Northwestern University researchers found in an NIH-funded study. A multi-electrode array implanted directly into the brain serves as a brain-computer interface (BCI). It allows researchers to detect the activity of about 100 brain cells and decipher the signals that normally generate arm and hand movements. A functional electrical stimulation (FES) device delivers electrical current to the paralyzed muscles, causing them to contract. The brain array activates the FES device directly, bypassing the spinal cord to allow intentional, brain-controlled muscle contractions and restore movement. The research team was led by Lee E. Miller, Ph.D., professor of physiology at Northwestern University’s Feinberg School of Medicine in Chicago. The team recorded the brain and muscle activity of two healthy monkeys as the animals performed a task requiring them to reach out, grasp a ball, and release it. The FES device then created the required patterns of muscle activity predicted by the brain activity. The researchers gave monkeys an anesthetic to locally block nerve activity at the elbow, causing temporary paralysis of the hand. With the aid of the neuroprosthesis, both monkeys regained movement in the paralyzed hand, could pick up and move the ball in a nearly routine manner and complete the task as before. Dr. Miller’s research team also performed grip strength tests, and found that their system restored precision grasping ability. The device allowed voluntary and intentional adjustments in force and grip strength, which are keys to performing everyday tasks naturally and successfully. The next steps include testing this system in primate models of long-term paralysis and studying how the brain changes as it continues to use this neuroprosthesis.